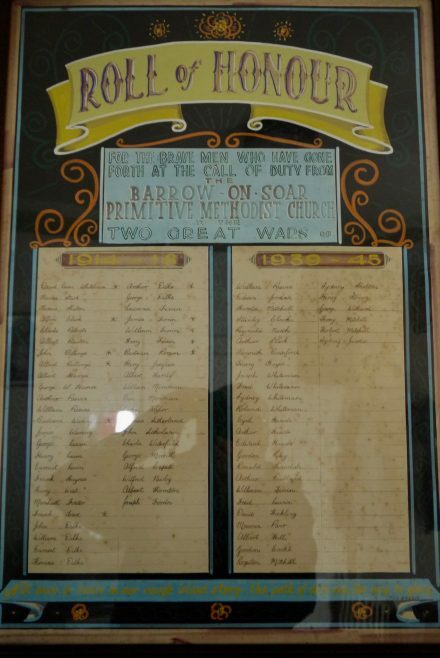 Barrow on Soar Primitive Methodist Church, North Street, Barrow on Soar, appear to have designed their own roll of honour on which to commemorate those from the church who served in both Great Wars. Note that despite being post Union, they had a clear sense of their identity. The roll is no longer on public display, so it appears unknown to those who have researched the fallen of Barrow on Soar. The image is not of the best quality, but was the best that could be obtained. Those men whose names are starred did not return. Their names are in bold type in this transcription. This page, however, is the only acknowledgement that these eleven men, of the seventy-one from the village who died, were associated with Primitive Methodism.